It was a cold breezy September day in Bruneau, Idaho when I walked up to the corrals at the Ace Black Ranch. 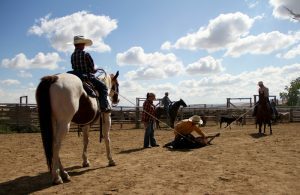 Their fall branding was underway and what caught my eye instantly was a young man roping with down right proficiency. The clincher for me was finding out this young man was about to turn 10 years old. At this particular branding, Jick Lee Schutte aka Squirrel, had more than just his calf to consider. There was a crew roping and other calves being caught and brought to the fire. Tradition was being followed in every sense of the word. From the original ranch brand, the (TL), the Wade saddles with rawhide wrapped horns, stunning silver bits, to a pan of homemade cinnamon rolls waiting to treat the hard working crew; baked from scratch by Letha, Jick’s grandmother. This branding was truly a family affair. When Jick had finished, he sat down by me and I asked him a few questions. He thought for a minute; “I have two heroes, my Dad, John Rommel Schutte and my Grandpa, Terry Black.” Jick said this with pride. 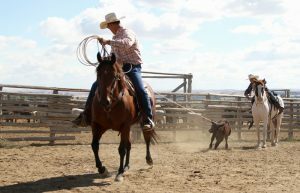 Both men were in the branding corral working hard along with his mother and grandmother. It was down right enjoyable seeing the branding irons glowing under the hot embers. Everyone seemed to flawlessly work hand in hand at this family branding. Jick’s Grandmother, Letha Black, contributed that her grandson is a complete outdoors kid. Fishing, trapping and building forts are some of his favorites, she proclaimed with pride. To understand how really amazing this young man is, I need to share a story. At the Bruneau Round-Up Jick, on his own, went to the Rose King booth and picked out a ring for his grandmother. He went into the booth and showed Rose his money and asked what he could afford. “He is just a sweet sensitive kid” said his Grandmother, Letha. Watching him rope you could see his sensitivity in his developing horsemanship. He never was rough with the tension of his rope with the calves. His horse was efficiently doing what Jick asked of him. These young men who are raised in this spectacular tradition have become rare. 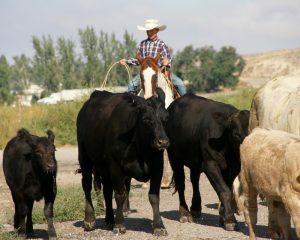 Jick is being raised as a Seventh Generation Horseman and is truly an asset to future generations. He is a bright young man who simply lives inside the inherited principles of a strong work ethic. There is abundant family heritage in this area. Respected Horseman, Martin Black, is Jick’s Great-Uncle. The branding itself was at the Ace Black Ranch, currently operated by Martin’s brothers; Terry and Tony Black and their families. As for the homemade cinnamon rolls? They were pure love and happiness with a touch of lasting warmth. I came away with gratitude for meeting my new friend, Jick Lee Schutte aka Squirrel, a Handy Little Cowboy.